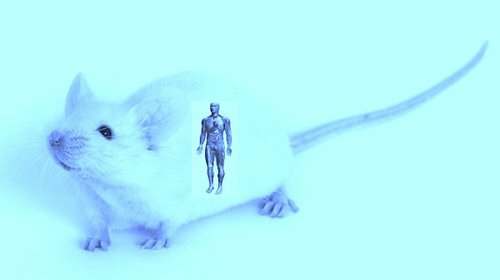 Specific in vivo testing on human tissues in humanized rodents. In this concept we have two research areas. One is the use of immunodeficient models for the preclinical efficacy tests of human cell products. The other is to test drugs in a humanized matrix. This model is used for xenografting human peripheral lymphocytes (huPBL) into immunodeficient mice. So a human immune system is engrafted in T-, B-, and NK cell-deficient mice (=huPBL SCID) This model offers the opportunity to test immune modulating drugs on a human immune system in a preclinical environment. Engraftment via i.p. route is a well established and robust method. The i.v. route is more challenging and only feasible with NOG and NSG. The special feature of the TT-huPBL model is that the PBLs of tetanus vaccinated donors (6 weeks - 2 years after immunization) get implanted in the SCID mice, followed by a boost immunization with the tetanus toxoid (TT). 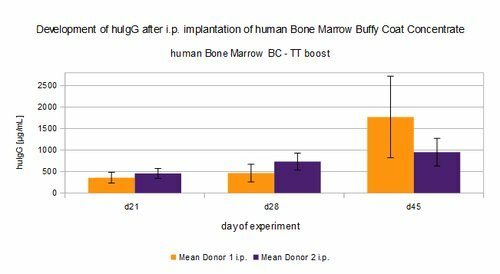 Afterwards, huIgG development will be compared with the specific TT-huIgG response. Additional immune response monitoring, like flow cytometry or cytokine measurement, is possible.